My name is Lok. The act of name-giving is often a rhetorical act by your parents who, in a cyclical trend, tend to project their fear, expectations, ideals and hope on you. My name is derived from the male lead, Chan Ka Lok, of Jin Yong’s debut novel, Book Sword Gratitude and Revenge. He was both well versed in martial arts as he was intellectually developed. His most famous act is that he choose to give up the woman he loved to save the country. Public interest comes before personal desires. I am not sure what this means, or perhaps I do, but I wish to ignore it. Born and raised in a suburb near Amsterdam. Made famous by Pulp Fiction, the place where searching you is a right the cops don’t have (actually this is no longer true anymore). My parents are from Hong Kong. Cantonese, my first language, is what I speak with them. I started learning Dutch at the age of 4, once I entered kindergarten. My dad worked for years in Bonn, the capital of former West Germany. Ended up being quite some summers in Germany during my elementary school time. Went to a bit of an elitist high school in Amsterdam where I was one of the few â€œforeignersâ€. Frequently ended up in ice cream parlors, arcade halls, football matches and at my friend’s place having coffee instead of going to class. After high school, no clue what to study â€“ interests too diverse (I still have that ‘problem’, know nothing about everything). Initial random choice was Computer Science at the University of Utrecht, in Utrecht. A place not too close so I could move out, and not too far so I could always go back. City in the middle of the Netherlands, cozy, with intimate canals. Lived there for a few years before I moved to a place in Amsterdam. In the meanwhile, made the switch to Chinese Studies. Got my MA degree in 2001 and received a scholarship to stay for a year at the Graduate School of Journalism of National Taiwan University in Taipei, Taiwan. 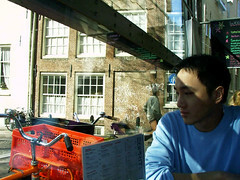 Chinese in the Netherlands, Dutch in Hong Kong and from Hong Kong while in Taiwan. â€œWhere are you from?â€ Wherever you want me to be from. The nation-state as a factor of identity clearly is slightly problematic for those living in the mestiza, the spaces inbetween. Age, ethnicity are some other common key identifiers for a self-image. Well, I am 26, and I would say an ethnic Chinese. But who am I really? What defines the core of my existence? â€œNot getting all High Fidelity hereâ€, as a friend of mine would say, but I am mostly what I like. What I am passionate about. I am a content junkie. I like reading books, and a big chunk of my favorite books include most of the works written by Murakami Haruki and Jin Yong. I like listening to music, and if you take a look at my mix minidisc right now, Sam Hui and Royksopp back to back, I realize why Angle wrote that he thinks those who are raised in diverse cultures are (morally) schizophrenic. I also like to watch movies, Wong Kar Wai being the Hong Kong auteur who gave me much inspiration on why I like the things I like, on how I view myself. But mostly inspiration on time, on space and on memories. It is 9:10pm, January the 17th in 2004. I am in Amsterdam. Reminsicing a special person. It is not meant to be, because it is neither the right time nor the right place. I wish you well.